You are here: Home / blog / L.A. Times Article About Belizean Restaurants in Los Angesles! L.A. Times Article About Belizean Restaurants in Los Angesles! These days I’m not at all surprised to see Belize receiving more than it’s fair share of international media coverage after spending many years relatively unknown, or better described as the “last undiscovered” paradise. Recent articles in National Geographic and the New York Times and many others have showcased many of the things that are truly unique and beautiful about this tiny, unspoiled Central American country which also borders the Caribbean Sea. But needless to say even I was a little surprised to see a feature article in the L.A. Times Food section! It appears in a section of Los Angeles know as “little Belize” their is quite the enclave of Belizean style restaurants serving up such national favorites as “boil up” and Belizean style Panadas. At least he doesn’t make too much mention of one of the staples here in Belize…. rice and beans… or is it beans and rice? The last undiscovered ethnic culinary enclave in L.A. might be a dozen-plus Belizean restaurants in the South Los Angeles area, a “Little Belize” offering the multi-culti flavors of the tiny country formerly known as British Honduras. Drive south from the 10 Freeway down Western Avenue to the limits of South L.A. and into Gardena you’ll encounter a cache of Caribbean culture, where food is ordered in Belizean Kriol, an English-based Creole language that teases but evades comprehension. The Belizean restaurants are inconspicuous among Mexican, soul food and other Central American diners in a neighborhood full of no-tell motels and possibly the largest collection of Latino storefront Pentecostal churches imaginable. On their tables you’ll encounter the food of two distinct Belizean cultures: Maya and Kriol. Most of L.A.’s Belizean restaurants draw from both the Yucatan’s Maya heritage and the British and West African mix known as Kriol. You can start with a Maya appetizer such as panades, tuna stuffed in a folded, paprika-stained, fried tortilla. A Kriol main like boil-up is a Saturday indulgence of pig tail, fish, hard-boiled eggs, yams, plantains, boil cakes made from flour, sweet potato, yucca and taro (called cocoa in Belize) covered in a stew of tomatoes, onions and peppers. 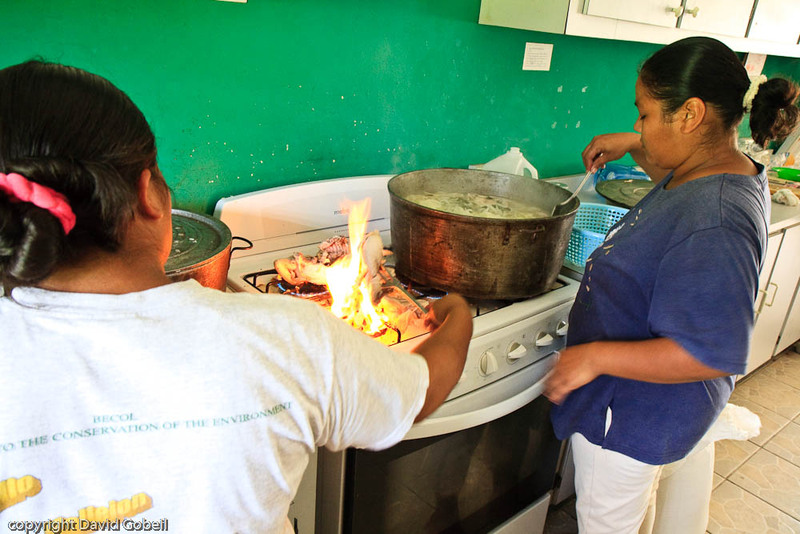 The only Central American country that was ruled by the British, Belize’s dishes are a mix of multiethnic influences, more so than the cuisines of neighboring countries that fuse along an indigenous-to-Iberian continuum, though there are rice and beans — every day. The three restaurants that stand out here are Ella’s Belizean Restaurant, Joan and Sisters and Mar’s Caribbean Gardens. Ella’s is a Belizean snack-shack, Joan and Sisters boasts Kriol home cooking and extended hours (most Belizean restaurants seem to close by 7 p.m., or when the food runs out), and Mar’s is a fancy island lounge serving solid Kriol cooking to go with cold Belikin beers. Hidden in a South L.A. strip-mall dominated by a barbershop and a tattoo parlor that’s always in party mode, Ella’s Belizean Restaurant leaves no Belizean longing for home. Five is a crowd in this smallish space where “to go” boxes of stews and rice and beans are squeezed through an opening too small for two stacked orders to fit through. Panades, garnaches (bean and cheese tostadas) and salbutes (fried tortillas topped with chicken) are packed to go for a mostly Belizean clientele. Ella’s is named after the daughter of owner Carla Dawson. Dawson and her sister Stacy opened the restaurant “a year ago and some change,” says Stacy. Cooking is in their DNA — “everyone in our family cooks.” Get the piquant lobster cooked in a red recado (annatto seed paste), vegetables and spices on a bed of rice and beans cooked in coconut milk. At the other end of the spectrum, Mar’s Caribbean Gardens is the most ambitious Belizean restaurant in the L.A. area in size and ambience. It even has a full liquor license. Try the smoky, spicy chirmole: pork-stuffed chicken and hard-boiled eggs in a black recado (dark annatto seed paste) soup. Owner Marie Jimenez and manager Fred Dixon have created “a place where Belizeans can bring business clients and feel proud,” says Jimenez.